The Denver Broncos, defending champions of the American Football Conference, were 5-3 as they traveled to Seattle to take on the up-and-coming Seahawks on October 29, 1978, a team they had beaten handily four weeks earlier at home. A season after reaching the playoffs for the first time in franchise history, Head Coach Red Miller’s team was still heavily dependent on the “Orange Crush” defense. The conservative offense was again directed by QB Craig Morton and he had fine receivers available in WR Haven Moses and TE Riley Odoms. The ground game operated with a six-member running-back-by-committee arrangement. Seattle, in its third year of existence and coached by the stoical Jack Patera, was at 4-4 and coming off a big win over the Raiders the previous week. The offense was led by the mobile lefthanded QB Jim Zorn and included WR Steve Largent and RB Sherman Smith as other key components. The defense included talented newcomers in LB Keith Butler and FS John Harris. There were 62,948 fans on hand at the Kingdome. The Broncos took the opening kickoff and drove 70 yards. 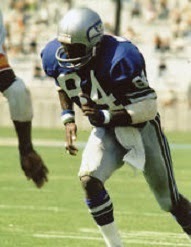 Craig Morton completed a pass to Riley Odoms for 26 yards to the Seattle 38 and fullbacks Lonnie Perrin (pictured above) and Jon Keyworth and HB Otis Armstrong all ran effectively. Jim Turner kicked a 34-yard field goal to give Denver the early lead. Seattle responded with a five-play, 66-yard drive of its own, culminating in a pass from Jim Zorn to WR Sam McCullum that resulted in a 44-yard touchdown. Efren Herrera added the extra point and the home team was in front by 7-3. 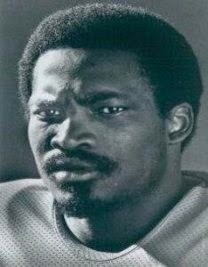 Denver put together another methodical series, utilizing more members of the running back corps, with FB Larry Canada carrying three times for 22 yards and HB Rob Lytle contributing 15 yards on two attempts. The drive stalled at the Seattle 17 and Turner missed on another 34-yard field goal attempt. The Seahawks punted following their next possession but got the ball back two plays later when WR Jack Dolbin fumbled after catching a short pass and DE Ernie Price recovered at the Denver 16. In a series that extended into the second quarter, Seattle scored in seven plays, the last a four-yard run by Zorn on a quarterback draw for a TD. Herrera kicked the point after and the Seattle lead grew to 14-3. The teams traded punts until the Broncos again drove into Seattle territory, but a fake field goal attempt failed. Shortly thereafter, LB Randy Gradishar intercepted a pass to give Denver the ball at the Seattle 34. It took just two plays to score, with Morton rolling out and throwing to WR Rick Upchurch for a 29-yard touchdown. Turner added the PAT and the Broncos had closed to 14-10, which remained the score at halftime. Heading into the third quarter, both offenses were having difficulty mounting drives, and passing was especially problematic. Midway through the period the Broncos got the ball at the Seattle nine following a fumbled snap by Zorn and Perrin ran for a one-yard touchdown. Turner converted and the visitors were in front by 17-14. 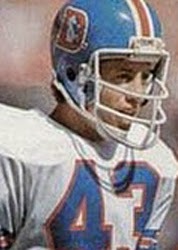 In the fourth quarter, a tipped pass intended for Steve Largent was intercepted by LB Bob Swenson to give the Broncos the ball at the Seattle 45. They picked up 12 yards before having to punt. The teams exchanged punts once more before the Seahawks, with Steve Myer now at quarterback, put together a series that involved an interception that, thanks to a fumbled lateral by Gradishar on the return, ended up giving the ball back to Seattle. Myer completed three passes and ran twice for ten yards and Herrera kicked a 37-yard field goal with 56 seconds remaining to tie the score and send the game into overtime. The Broncos had first possession in the extra period and punted. A short series by the Seahawks also resulted in a punt, but after HB Dave Preston ran for 16 yards, Perrin fumbled and SS Autry Beamon recovered for Seattle at his 41. Zorn was back behind center, but his first down pass was deflected and picked off by CB Steve Foley (pictured at left), who returned it 30 yards to the Seattle 36. Keeping the ball on the ground, the Broncos reached the Seattle one and Turner came in to kick an 18-yard field goal. The first try was wide to the left after Morton, the holder, barely fielded a bad snap, but the 15-year veteran placekicker got a reprieve when the Seahawks were penalized for having twelve men on the field, and given another shot he was successful. Denver came away with a 20-17 win at 12:59 into overtime. The Broncos significantly outgained Seattle (423 yards to 258), with the six Denver running backs totaling 278 rushing yards, and had the edge in first downs (25 to 19). The Seahawks turned the ball over five times to three suffered by Denver, while the Broncos committed 12 penalties, at a cost of 103 yards, to 9 flags thrown on Seattle, for 61 yards, although the last penalty on the Seahawks was ultimately the most costly. Jon Keyworth led the strong Denver running attack with 70 yards on eight carries, followed by Larry Canada’s 68 yards on 15 attempts and Lonnie Perrin gaining 57 yards on 15 tries that included a touchdown. Craig Morton completed just 11 of 28 passes for 155 yards and a TD, although he had none intercepted. Haven Moses caught three of those passes for 60 yards while Rick Upchurch added 42 yards and a score on two receptions and also returned three punts for 61 yards. For the Seahawks, Jim Zorn also had a rough passing performance as he was successful on only 9 of 29 throws for 110 yards and a touchdown while giving up three interceptions. In his relief stint, Steve Myer was 6 of 11 for 38 yards and was picked off once. Sherman Smith ran for 73 yards on 17 carries and caught four passes for another 21 yards. Sam McCullum (pictured at right) gained 57 yards on his three pass receptions that included a TD. The overtime win for the Broncos marked the third (and last) time they went into OT during the season, and was the second time they came out on top. They lost to the Jets the following week but then won four of five on the way to finishing with a 10-6 record and topping the AFC West for the second straight year. They did not get deep into the playoffs this time, however, losing to Pittsburgh in the Divisional round. Seattle recovered to win five of its last seven contests and post the first winning record in the young franchise’s history at 9-7, which ranked third in the highly-competitive division.